In the second half of the 1880th Nikolai Rimsky-Korsakov interrupted his work on operas for a short pause. It was then that Capriccio Espagnol and Scheherezade were written. The symphonic masterpieces appeared one after another respectively in 1887 and 1888. Both Capriccio Espagnol and Scheherezade were destined to live a long and happy life on the concert stage. The main explanation for the success was a bright picturesque melodious material of the music but even more important – a natural and exciting manner in which it was developed. Rimsky-Korsakov was a poet of the orchestra. So great was his mastery and ingenuity in combining and contrasting colours and timbers that this in itself was a phenomenon of art. «In Rimsky-Korsakov’s scores … if the music depicts a snowstorm then you feel as if snowflakes are dancing breaking away from the violins’ strings. If the sun is rising then all the instruments dazzle you with the bright-red light. And if it’s water then you hear in the orchestra the waves running and breaking into splashes». We shall venture to continue the words by Sergei Rachmaninov. A stormy sea in which Sinbad’s ship is wrecked (Scheherezade , the forth movement, the stroke of tom-tom); sweet words by Scheherezade (violin solo) – these and other musical images sound like trying to overcome the frontiers of music to become a visual phenomenon. Both Capriccio Espagnol and Scheherezade are build up as suites, that’s what these two works have in common. Capriccio is actually a sequence of dances. The musical material of the first movement reappears in the third and fifth movements and it brings some features of rondo into the whole structure. Scheherezade on the other hand is closer to the genre of sonata. Three out of four movements are sonata-like. The general plan of the composition is also typical for sonatas: the last movement summarizes the material of the whole work. And, what is most important, the whole concept of the music is gradually built up out of relatively few themes. «The Story of the Prince-Kalandar», «The Young Prince and Princess», «»Festival in Baghdad. The Sea. The Ship Breaks against a Cliff Surmounted by a Bronze Horseman». However later on the composer annulled the titles. He also warned against excessive search of direct connections between leit-motifs and the same repeating poetical ideas. «Appearing every time in a different light the same motifs and themes every time correspond to different images, actions and pictures», he said. Three Wonders is a well-known symphonic picture. It’s an introduction to the last, 6th picture of the opera Tale of Tsar Saltan. The opera was written in 1899 – 1900 and first staged in the Savva Mamontov’s Russian Private Opera in 1900. Musical themes in the opera relate to a fairy city of Ledenets and appear each in a proper moment of the opera. Strictly speaking there are four wonders, not three: a squirrel sitting under a fir-tree, cracking golden nuts with kernels of pure emeralds and singing song; thirty three knights rising from the waves led by old Uncle Chernomor; a Swan-Princess; and the City of Ledenets. 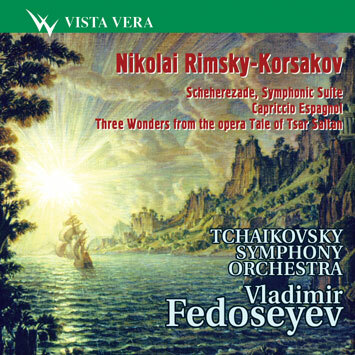 It is remarkable that Rimsky-Korsakov’s wonders are purely Russian. The theme of the squirrel for example is borrowed from the folk song In the Garden, while the theme of the Swan Princess is taken from the folk song A Duck in the Sea.